One of the key challenges when dealing with different types of pumps is the huge range of different performance characteristics required when dealing with different mechanical models of pumps but also different applications for the same type of pump. The controller in question must therefore be able to deal with a wide range of situations and still perform. The answer to this question is a controller which can take standard hardware whilst enabling a quick firmware change to change the performance. One of the most important characteristics for many pump applications is being able to accommodate changes in external factors (for example pressure) whilst retaining accurate and consistent performance. In many cases, expensive closed loop systems have been thought to be the only option. However, in this application, it was absolutely critical that the solution be sensorless. 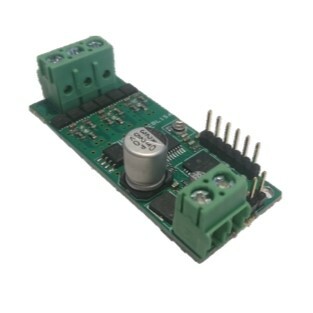 The only option to deliver this exacting requirement was to develop a controller which would read the Back-EMF from the motor and then use this to directly the motor performance against what the user had specified. The controller could then adjust the drive output to correct any changes. A further complication of this particular project was that there was a critical requirement from the customer that the controller be as small as possible and as light as possible. This was because many of the applications the controller was to be used in were very weight and size conscious. The impact of this on the design was significant but was something which was accommodated by going for a longer and slimmer board (as opposed to a square board). Protecting the users and the associated equipment is always something that we focus on and in this case the project was no different. This particular controller features over current protection, over temperature protection, reverse polarity protection and a range of other important safety protections. These protections provide peace of mind for the users, protect the pumps being used and also protect the controller that is being used. This is critical in delivering long life and reliable performance. One of the most important features of this project was the need for the controller to be programmable by the customer in order to deliver a range of options for their customers. We worked closely with the customer to deliver the performance they required and continued to work with them to develop bespoke firmware for specific applications and customers. There were a large number of challenges associated with this project which we worked hard to solve. Not least of these was the range of programming options we had to offer the customer. This involved considerable time optimising each programme to the specific requirements of that particular application.